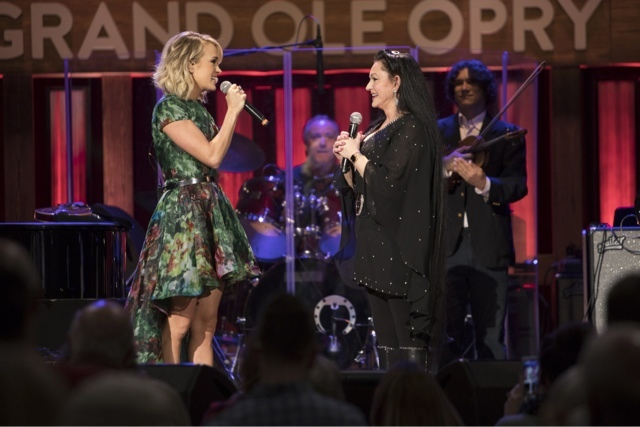 NASHVILLE, Tenn. (November 15, 2016) – Grammy-winning songstress Crystal Gayle was surprised during her Grand Ole Opry performance this evening by Opry member Carrie Underwood with an invitation to become an official Opry member. Gayle will be formally inducted into the Opry on Jan. 21, 2017 by her sister, Opry legend Loretta Lynn. Gayle made her Opry debut nearly 50 years ago on the Ryman Auditorium stage, singing the country classic “Ribbon of Darkness” at age 16. Tickets for Gayle’s Opry induction night and all upcoming Opry performances are available at opry.com.